One of the oldest gems known to man, historic records refer to it as far back as 1500 B.C. Peridot was first discovered on Topazios Island in the Red Sea. The word peridot comes from the Arabic “faridat,” meaning gem. Its history includes jewelry making by the Egyptian pharaohs. Trespassers to their secret peridot mines were subject to death. There is speculation that Cleopatra’s famed emerald collection actually may have been peridot. Still highly prized in Egypt, the peridot is that country’s National Gem. This brilliant lime-green gemstone is one of the two birthstones for the month of August, as well as appropriate for 16th wedding anniversaries. It is also worn by those who love its unique lime green color. The peridot gemstone is the rare and translucent form of the common mineral Olivine. Olivine. Olivine has been discovered in comet dust gathered by robotic space probes, found on the moon, detected on Mars, and even found some in certain rare meteorites, which have landed on Earth. Peridot and diamond are the only two gemstones that originate in the earth’s mantle. Formed in the earth’s mantle in the layer between the earth’s crust and the outer core, peridot is thrust to the earth’s surface through tectonic movement and dramatic volcanic events. 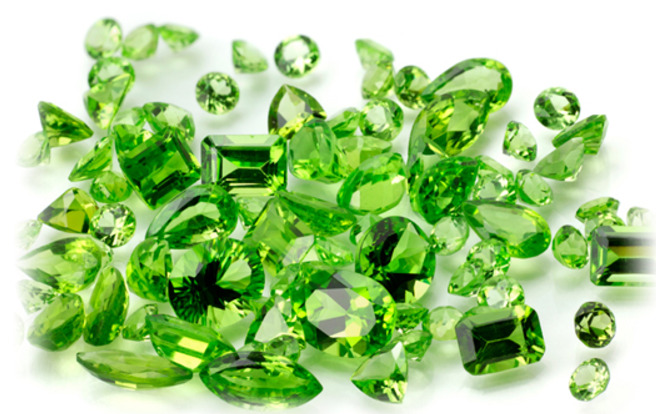 Peridot is one of the few gemstones that occur in only one color - green. Its shades vary from light yellow green to dark brownish green. There is no known treatment to improve its color or clarity and therefore is not heat-treated or enhanced in any way. The finest peridot gems are a beautiful, clear lime green. Although peridot only measures 6.5 to 7 on the Mohs scale, cut gems are durable and not easily subject to breakage. Ancient Egyptians called peridot the “gem of the sun,” believing it protected its wearer from evil. It was used as a charm against sorcery and magic, evil spirits, night terrors, and madness. It cured cowardice, calmed anger, as well as brightening the wit. Many today still believe in these powers. Whether worn as a birthstone, anniversary gem, or for a special personal delight, no gem can rival the peridot for its exquisite lime green color.